Liberation Campaigns provide an opportunity for minority groups to build a community made up of, and led by, students who self-identify within the minority group. Liberation Campaigns exist to connect our student members, enabling students to build friendships and share experiences with others who share their lived experience to act collectively in highlighting issues, raising awareness and campaigning for change. The Black Students’ Campaign is here to represent the interests of and connect black students studying at BU. From campaigning on issues like the black attainment gap to hosting socials that connect the community, the Black Students’ Campaign is here for you. The Students’ with Disabilities Campaign is here to represent the interests of and connect disabled students studying at BU. From campaigning on improving access at BU to providing accessible events that build a community for students, the Students’ with Disabilities Campaign is here for you. 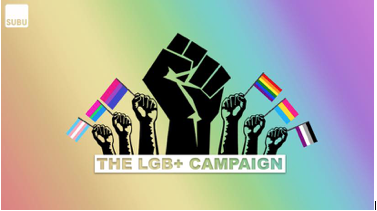 The LGB Plus Students’ Campaign is here to represent the interests of BU students who identify as Lesbian, Gay, Bisexual and other minority sexual orientations. From campaigning on queer issues to helping plan and deliver Bournemouth Student Pride, the LGB Plus Students’ Campaign is here for you. The Students’ of Colour Campaign is here to represent the interests of students of Asian, Arab and mixed heritage studying at BU. From campaigning on issues that affect these students to hosting socials that connect the community, the Students' of Colour Campaign is here for you. The Transgender and Non-Binary Campaign is here to represent the interests of trans* and non-binary students at BU. From improving the provisions of gender neutral toilets on campus, creating safe and accessible events for students and helping to plan and deliver Bournemouth Student Pride, the Transgender and Non-Binary Campaign is here for you. The Women’s Campaign is here to represent the interests of self-defining women studying at BU. From campaigning to raise awareness of personal safety and standing together to tackle gender inequality, the Women’s Campaign is here for you.